When thinking of survival, the Quikclot Advanced Clotting Sponge is usually not at the top of the list. We usually think about the things that we use most such as band-aids, cotton balls and maybe some super glue in case someone got injured. 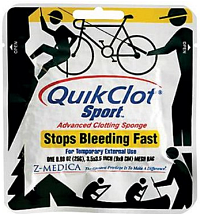 The Quikclot clotting sponge should definitely be added to your pack. Many cases will call for more than just a band aid and depending on how bad the cut is, it may even be life threatening. The purpose of the Quikclot sponge is to stop the bleeding. It works as easy as this.. Quick clot is a natural enzyme that starts the blod clotting process in the body. Our bodies have small amounts of it that are there naturally, except for hemophiliacs. Quick clot is simply concentrated to a high level like vitamin supplements. You simply press the sponge against the wound, even an injury that is bleeding severely and it will cause it to either slow way down or most cases, stop completely. It’s advised to roll some sort of bandage or gauze around the Quikclot to hold it in place. 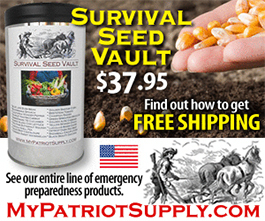 Many sizes are available and the best prices can always be found here on Amazon.